"I vehemently and in strongest words condemn the dropping of the latest weapon, the largest non-nuclear bomb, on Afghanistan by US military," Karzai said in a Twitter post. "This is not the war on terror but the inhuman and most brutal misuse of our country as testing ground for new and dangerous weapons," he wrote, stressing: "It is upon us, Afghans, to stop the USA." 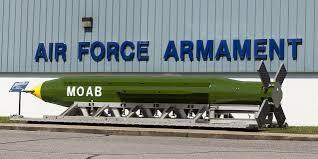 The GBU-43/B Massive Ordnance Air Blast Bomb targeted a network of caves and tunnels of the Islamic State terrorist group in the Achin district of the Nangarhar province, in eastern Afghanistan. The 9.5-tonne bomb was dropped on Thursday by an MC-130 aircraft, operated by Air Force Special Operations Command. Former NSA contractor Edward Snowden wrote on his Twitter page that Pentagon’s recent test in Afghanistan of a powerful non-nuclear bomb targeted tunnels that were possibly built by the United States in the 1980s. "Those mujahedeen tunnel networks we're bombing in Afghanistan? We paid for them," Snowden wrote, attaching an excerpt from a 2005 New York Times article, which suggested that the construction of the Tora Bora cave complex in the province of Nangarhar was financed by the CIA in 1980. At that period, Washington supported mujahedeen, who fought against the Soviet military in the country.